When several products are sold as one combined product, it is called bundle product. 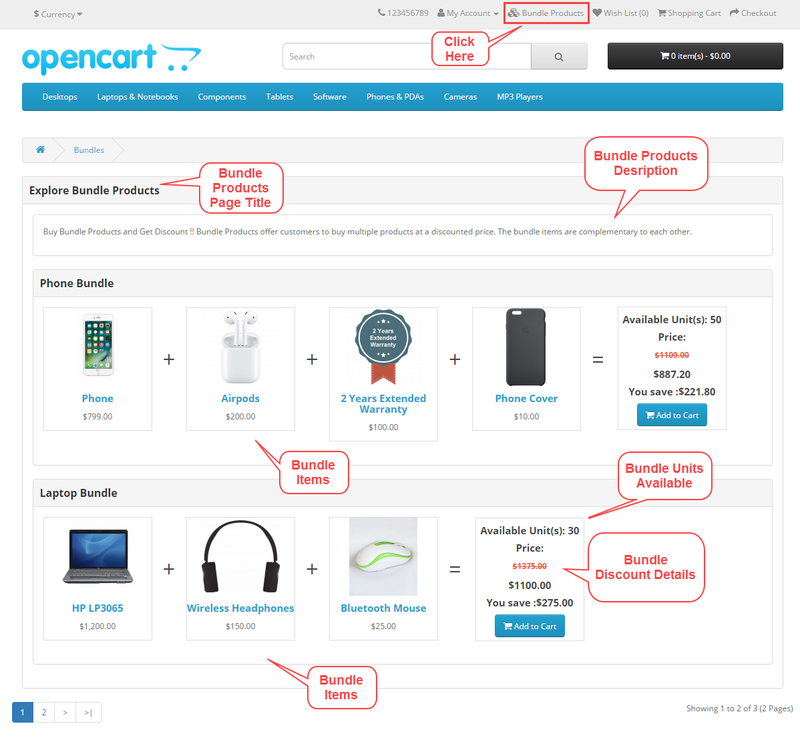 With the help of Opencart Bundle Product extension, the admin will be able to create bundle products for its customers. 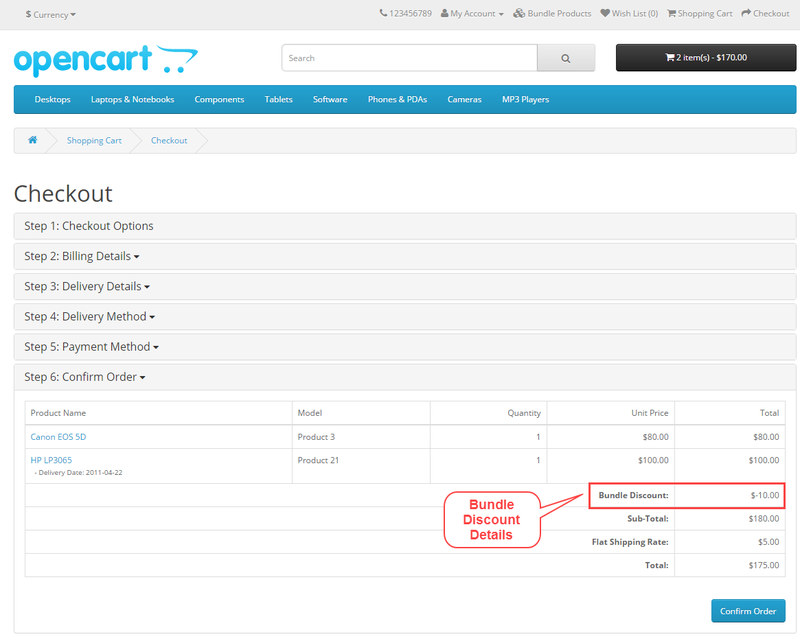 The admin can set the number of bundle products to display on the store. Calculate bundle discount according to the fixed or percent based method. Define the number of bundles to show on the bundle page. Define the number of bundles to show on a product page. Set the front-end title of the bundle product page. Display description on bundle product page. Choose the bundle product availability dates. Show or hide units available of the bundle product. Calculate bundle discount using fixed or percentage method. Set the sort order of the bundle products. Enable or disable each bundle product status. The customers can select the product options in the bundle. Show bundle discount value in cart and checkout. 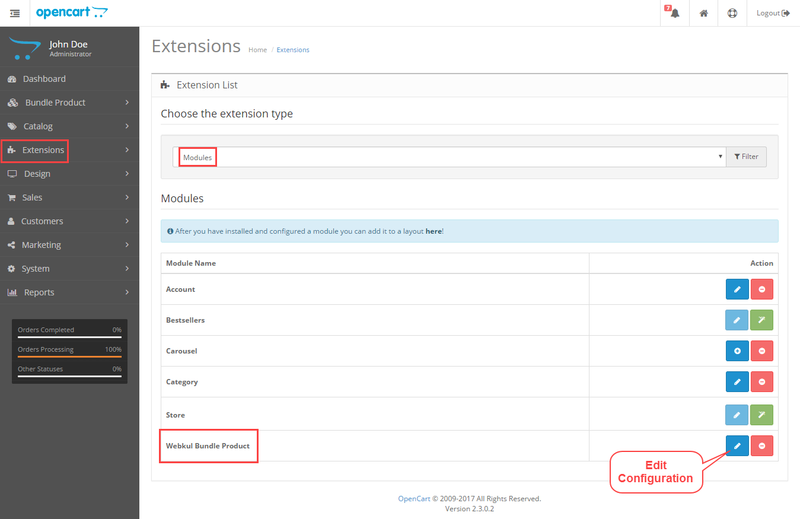 Now, navigate to Extensions>Modules. Find Webkul Bundle Product from the list. Click the Install button as visible in the screenshot below. After the module installation, the admin needs to go to Extensions>Modules>Webkul Bundle Product and click Edit. Status – Select Enabled to show bundle products on the store. Else select Disabled for hiding the bundle products on the store. Note: If Disabled is selected, it will also hide bundle products button on top. Bundle Limit Per-Page – Enter the number of bundles to display on the bundle products page. Bundle Limit on Module – Enter the bundle limit for all pages except bundle page and bundle product page. Title for Bundle Page – Enter the front-end title for the bundle products page. Description for Bundle Page – Enter the description which will appear on the bundle product page. To display bundles on the product page, the admin needs to navigate to Design>Layouts. 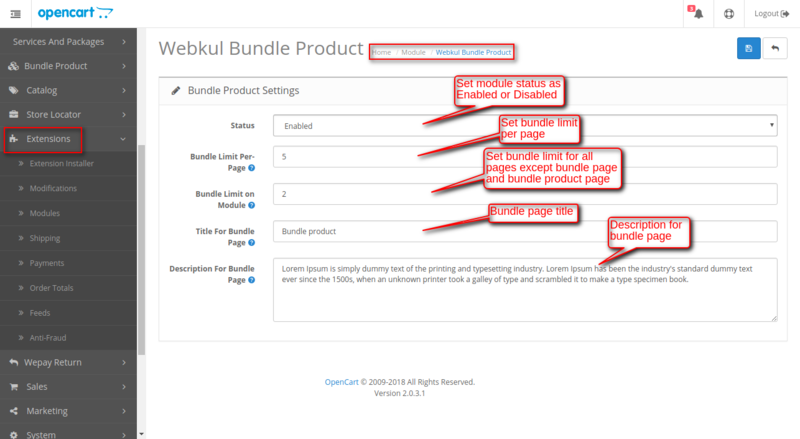 Edit the Product page and then, select the Webkul Bundle Product module and click Save. To allow bundle discount to customers, the admin needs to go to Extensions>Order Totals and click Edit in Bundle Discount. The admin has to enable the bundle discount status for offering bundle discount to customers. The following page will open, set the status as Enabled to offer bundle discount to customers. Else, select disabled and the bundle discount will not appear in the cart and checkout. After enabling the module status, the admin will find the Bundle Product menu option as visible in the screenshot. To manage bundle products go to Bundle Product>Manage Bundle Product, the following page will open. The admin will see the list of all the bundle products of the store. The table will show bundle ID, bundle name, bundle validity, quantity, and status. Add – Click the Add button to create a new bundle product. Delete – Click Delete button to remove an existing bundle product. Edit – Click the Edit button to update an existing bundle product. After clicking the Add button, the admin needs to provide the following information about the bundle product. Bundle Title – Enter the bundle product title which will appear on the store. Add Products – Select and add the products in the bundle. Date – Select the bundle product availability dates. Valid From and Valid To. Units Status – Select Yes for displaying bundle available quantity on the front-end. Else, select No for hiding the bundle available quantity. Units Available – Enter the available bundle quantity. Discount Option – Select how to calculate the bundle discount – Percentage or Fixed. Add Discount – Enter the discount value here. Sort Order – Set the order sequence of the bundle product. Status – Set the status of the bundle product as Enabled or Disabled. If Disabled, the bundle product will not be visible in the store. The customers can view the bundle products of the store by clicking Bundle Products link on top. The following page will open showing bundle product title and description. All the available bundle products of the store will appear here. Each bundle will show the product name, price, image, available units, and bundle discount details. 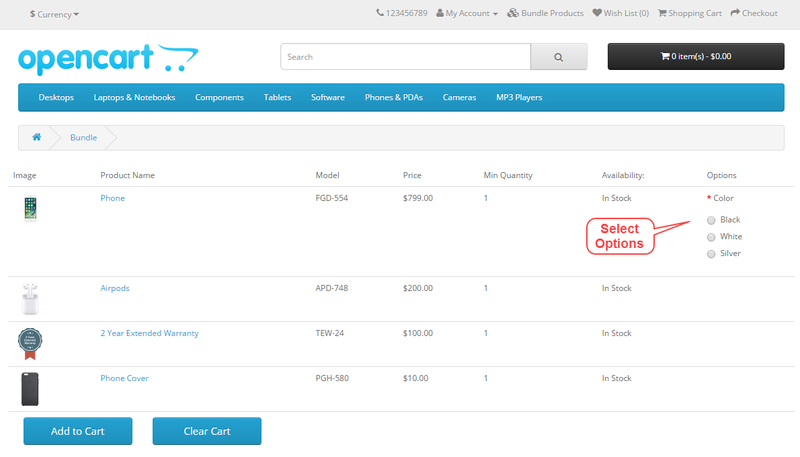 If a product in the bundle has any options available, the customers can select it. 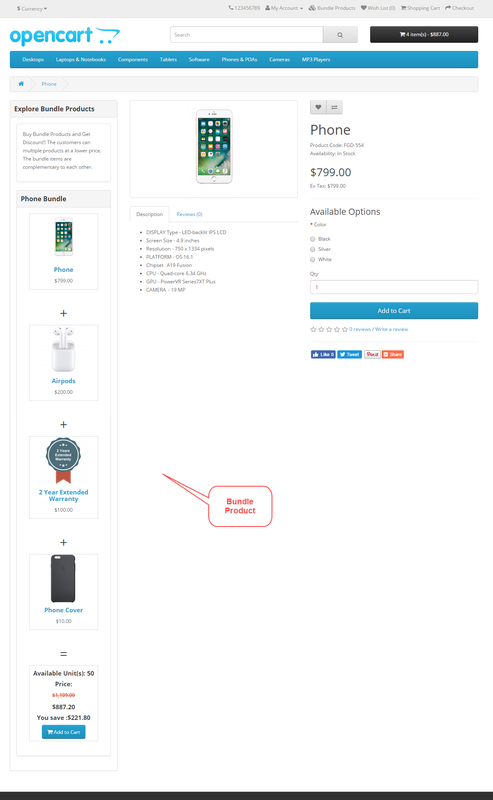 After selecting the option, the customers can click Add to Cart button for adding all the bundle items to the cart. The bundle discount value will be visible in the shopping cart. The bundle discount value will also be visible in the checkout process at the confirm order step. Apart from seeing the bundles on the bundle page, the customers can see the bundles on the product page as well. Note – Bundles will only appear if a product is a part of the bundle. Other bundles will not appear here.